A week off work is always great, right? But, what's better than a week off work is getting the opportunity to spend a few days of it in Manchester! My husband was booked to travel down to Manchester from Scotland with his work for a few days and my reply when he asked if I'd liked to join him? Erm, of course, are you crazy! 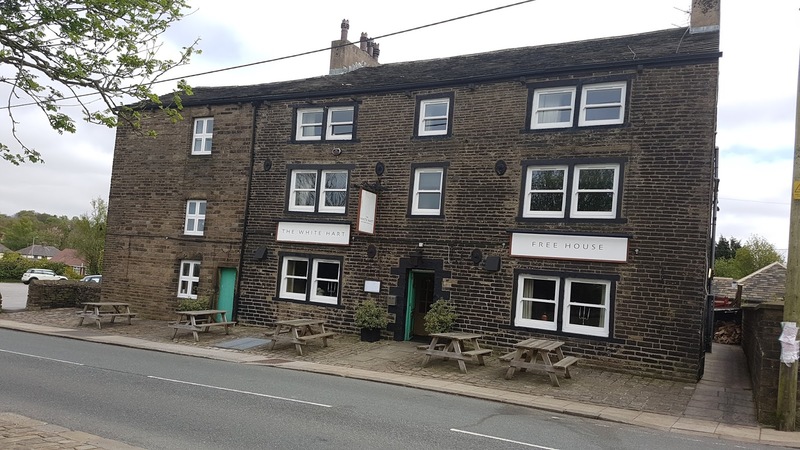 My husbands employer had made a reservation for him at the White Hart Inn, Lydgate. After calling up, the booking was changed from single occupancy to a room suitable for us both. The only thing we were unsure about was what to do with our dog, however another quick phone call to the hotel swiftly solved our dilemma; the White Hart is dog friendly. So no more thoughts of tearful goodbyes to our four legged pal; instead he joined our overnight bag in the back seat of the car and off we went - thank you White Hart! We had planned to arrive in Manchester around 3pm on the day of arrival, however a late set off and bad traffic (don't you just love the M6!) meant we arrived closer to 7pm. 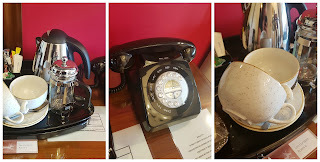 We called ahead to the hotel to let them know we would be late and the staff were amazing, they even made a dinner reservation over the phone for us. We arrived and were quickly checked in and directed to our pet friendly room without a hitch. The room given to us was called 'Lord Lydgate - Room 6' on the 2nd floor, which wasn't a problem - means you don't have to feel guilty about having that pudding, am I right? ;-) - the room was lovely, really traditional with beautiful wooden beams, shuttered windows and a gorgeous double bed. We were making around 10 hampers for my husbands work so once we checked in, we took the dog to the room and started making trips from the car up with the 100 bags (ok, ok, it was only 12 but they were REALLY heavy!) once we got all the bags up and had stopped sounding like a pair of 87 year old chain smokers, we heard a knock at the door from reception staff. So there's me standing there amongst a sea of Tesco bags (10p ones, not 5p - for this job we needed strength!) my fringe stuck to my sweaty forehead, panting like I'd just ran the marathon and I honestly thought 'Oh crap, they are going to make us take all of this back to the car' So, tripping over a rogue bag handle, we answered the door to a lovely lady from reception (I'm so sorry - I didn't catch her name). She said she had noticed us bringing in a large number of bags and did we want a bigger room? I had to ask her to repeat herself again as I wasn't sure I'd heard her properly over thudding of my pulse in my ears (telling me how awfully unfit I am but we'll choose to ignore that part). Yes, we'd both heard her correctly, she was offering us a bigger room! 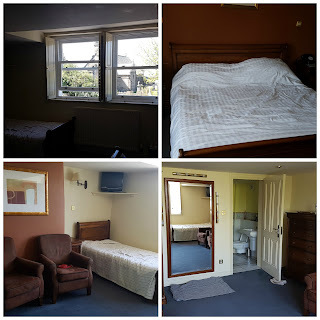 We were shown down to the first floor and into a second pet friendly room (John Radcliffe - Room 11) and wow, you will see from the photos how much space we had, we did not expect a room like this at all! 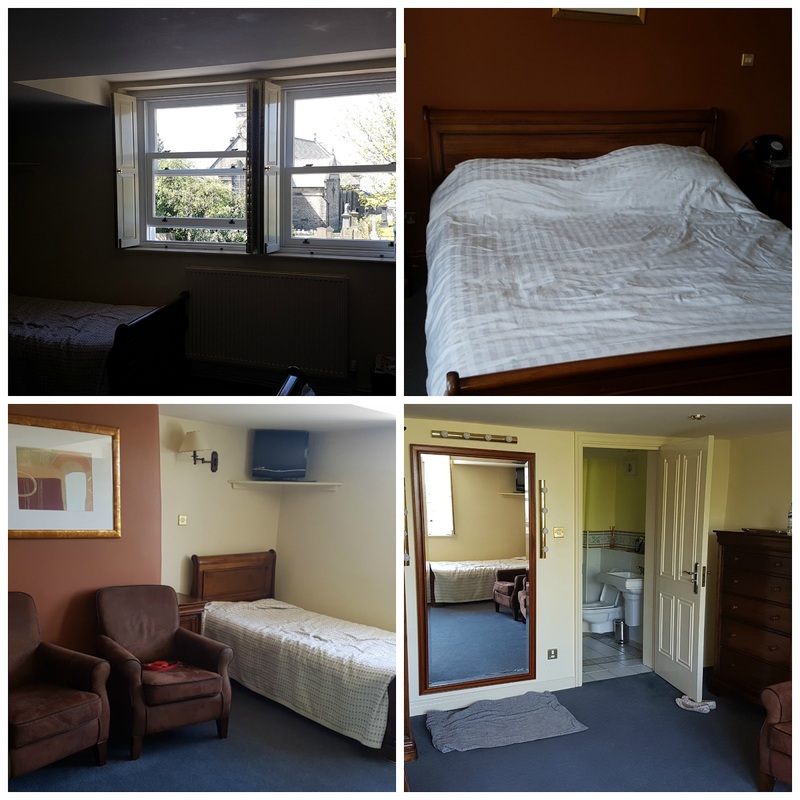 Room 11 has an impressive dark wooden super king size bed, the room also features a single bed, and a desk with a seat for working at or getting ready for the day. 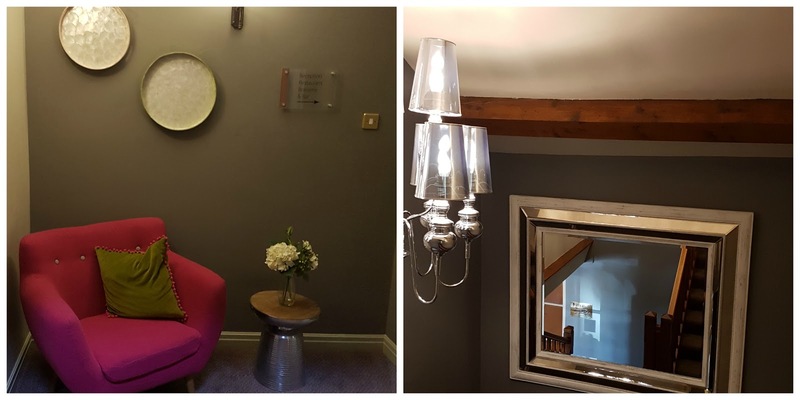 Each room has a mirror with studio lighting surrounding it, perfect for applying you make up or taking the perfect selfie. The bathroom features the biggest hand basin and bath tub I think I've ever possible seen! Whilst my husband was out at work, my plan was to be in the hotel room writing content for blog posts so having a bit of extra room was a godsend! After we got over the shock of the room swap, we made our way back downstairs to the restaurant for our dinner reservation. I had read some reviews online before coming to the hotel and to be honest, some of the reviews on TripAdvisor were a bit negative, so I'd decided to keep an open mind until I'd tried it for myself. 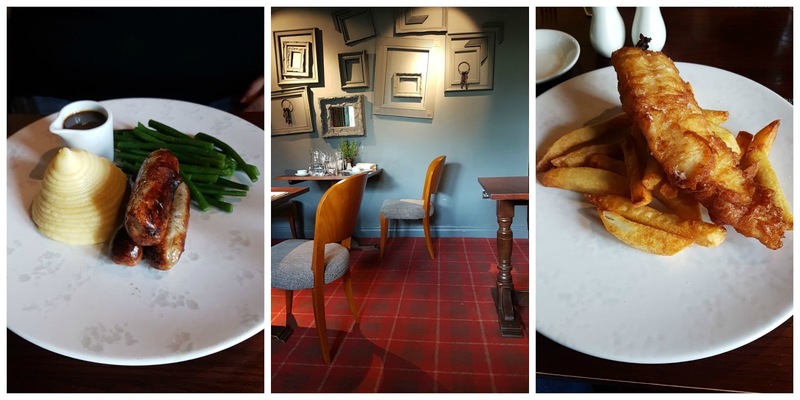 We didn't bother with starters or deserts, just main courses and I'm glad we did because the meals are delicious and very filling! I had the sausage and mash and oh my goodness, it was mouth watering! The mash was some of the creamiest mash I've ever tasted - and I'm more than a little bit of a potato fiend, so I know my mash! The sausages were so tasty and cooked to perfection and the accompanying onion gravy just finished the whole dish off. Would definitely recommend it. My husband had the fish and chips, which came along with some tartare sauce and mushy peas. The fish was melt in your mouth and the batter was the just the right consistency. Really impressive. Whilst we were waiting our food to arrive, the waiting staff brought over a basket of breads which are baked fresh on the premises every day. We could chose from sour dough or olive. It was delicious and so fresh! I was also able to try out their room service throughout my stay, purely for review purposes, of course! 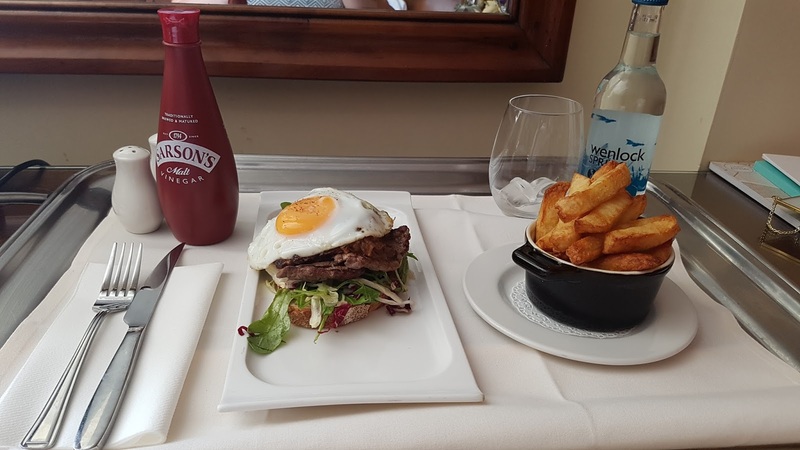 Nothing to do with me being lazy at all... ;-) I felt truly spoiled when my food arrived, I had about 10 minutes to wait both times I tried it - don't judge me - trying it twice gives you a better review! (that's my excuse and I'm sticking to it!) both times it was brought on a plush silver tray, with proper little salt and pepper shakers - it's all about the little details isn't it. The décor in the restaurant and in the hotel in general is lovely, I really like the shabby/vintage infusion. I think, if I had to describe the décor in this hotel in one word it would be 'quirky' every corner you turn there is something different. 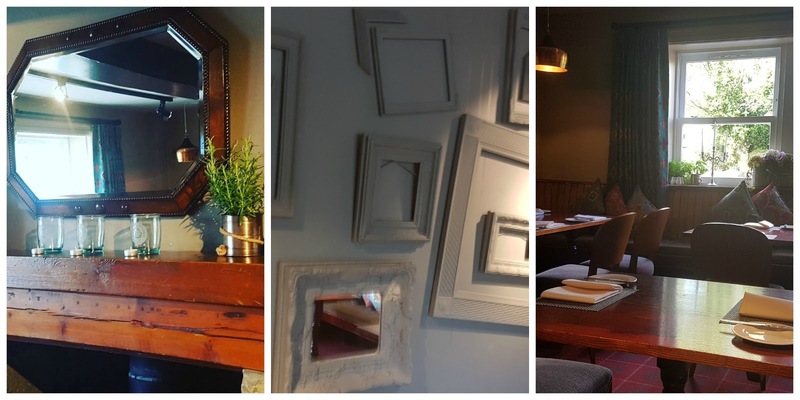 From full length glass mirrors and pink feature armchairs in the hallways to shabby chic frame faces and tin can plant pots in the restaurant - it really is the perfect balance. From surprise upgrades and comfy beds to mouth wateringly beautiful food and tasteful décor, this hotel has been the perfect base for the past couple of days; but I have to make a special mention to the staff, they say you are only as good as the team supporting you and this couldn't be closer to the truth for the White Hart Inn, we haven't had one single negative encounter with any member of staff in the hotel, everyone is so accommodating and can't do enough to help out. Very impressive! The only tiny suggestion I would have, is to make it more known that they accept pets, it doesn't mention it anywhere on their website that I can see and if we hadn't called up to check whether they take pets or not, I wouldn't have accompanied my husband on this trip. Therefore they would have lost out on the extra business - just a pointer from a lover of mans best friend! I hope you enjoyed this post, if you do decide to visit the White Hart Inn, please comment and let me know what you thought, I'd love to see if you were as impressed as I was.